I grew up watching all the good ol’ cartoons. Mickey & Minnie, Silly Symphonies, Merrie Melodies, Looney Tunes and Hanna Barbera to name a few. 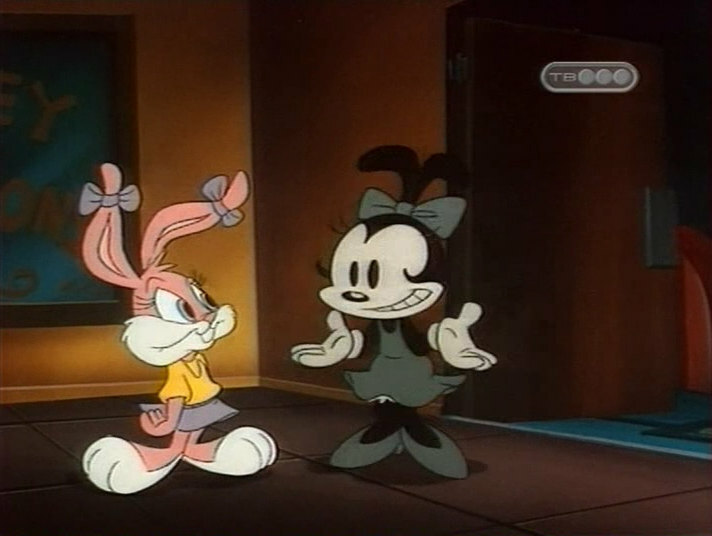 But I was also fortunate to catch Tiny Toon Adventures in its heyday and Babs Bunny was a HUGE role model for me. She wasn’t afraid to be funny, outrageous or dramatic. And above all else, she didn’t give a darn what people thought of her. Something everyone, especially women need to embrace. Babs, Buster, Plucky, Hamton and the rest are all counterparts to their “mentors” Bugs, Daffy and Porky. I think it was really interesting that the creators decided to make Buster the smooth, cool side of Bugs and Babs the more comedic, wild side. Usually, in film and television, women are the ones who have to rein the men in. It’s a refreshing twist. As I’ve said in the past, I consider myself a natural feminist, because being a woman, I naturally found myself more interested in my gender. Can you blame me? Everyone wants to see themselves represented on the screen. But that whole issue is better left for another post. Back to Tiny Toons, Babs found herself in a similar dilemma; in the 30th episode of Tiny Toons, Fields of Honey, Babs is inspired to find her female mentor, after each of her friends get to work with their male mentors. (Buster with Bugs, et cetera) Long Story Short: Instead of choosing Bugs, being the natural feminist she is, Babs goes on a search to find Honey. The female partner to Bosko one of the original toons from the Merrie Melodies. When Tiny Toon Adventures went on DVD, I watched the behind the scenes commentary. Story Editor, Sherri Stoner, said that she was inspired by a personal experience from her youth. When she was in Kindergarten her teacher wrote on her report card, “Having Sherri in Kindergarten is like having a cartoon character in class. We’re going to work this year on curbing her wonderful enthusiasm.” Fortunate for her, Sherri’s mother went in and told that teacher exactly where she could stick her enthusiasm. But it also inspired Sherri because Babs was someone who would never allow her enthusiasm to be curbed. This is soooo great!! My name being Barbara, I have never liked the nickname “Barbie”, (though my big brother and Aunt Sylvia are the two exceptions.) I always thought of Barbie as unrealistic and only valued for her looks which are admittedly over the top and unrealistic. “Babs” I always thought of as a “slutty” term- don’t know why. From now on I will allow the nickname only if they can identify the “Bugs Babs”.